All of the departments stressed that their method is based upon applied-research: research projects are first selected by technical advisory boards on the basis of direct feedback from farmers. They are then able to involve farmers in the projects and set up regional hubs and networks that validate the results of their research. Having highlighted the rooftop greenhouse initiative last week, let’s take a look at a few more departments within Inagro. Providing advice and guidance to people who want to get involved in freshwater aquaculture. These could be students, investors or institutes. Applied research on improving the sustainability of pike-perch production. Inagro’s small aquaculture outfit is constantly working to improve practices in brood stock management, selection, growth and quality within the construct of recirculation systems. With exhaustive research and applied practices, they are improving the economics of sustainable fish farming. Stefan stressed the importance of their knowledge being transferred to the end consumer. To that end, anyone who is interested in the industry can go to Inagro and work one month for free, gaining access to all the expertise the facility and its team has to offer. A final facet of the aquaculture team is to work toward integration with other departments; an example is the effluent water being sent to the greenhouses to be used in tomato production, and in trials for cucumbers and other vegetables. Inagro’s insect cultivation department is closely associated with the aquaculture team, as Stefan is the head of both divisions. I spoke to David Deruytter, who is part of the team that is leading the way in pushing for insect cultivation to be adopted as an integral piece of Europe’s agricultural strategy. They focus on processing various types of biomass from this stock and produce 40-50kg of insects on a good week . Insect cultivation is vital to closed loop agricultural systems, as it offers a way to valorize waste streams. David said that this would be the greatest opportunity for collaborating within the AVF; organizations that need guidance on what to do with waste streams can be sure to find answers at Inagro. Bioboost: creating value chains in the bio-based economy; valorization of waste streams. Redung: developing a model for precision irrigation in greenhouses. Entomospeed & Entomatisation: developing production techniques in insect production systems. Nuredrain: valorizing nutrients out of drainage discharge and greenhouse effluents. In the coming weeks, Broadcast Manager Jason Moon will perform an interview with Inagro for the AVFfm podcast series. For more information on Inagro, please follow this link. For an English brochure, click here. 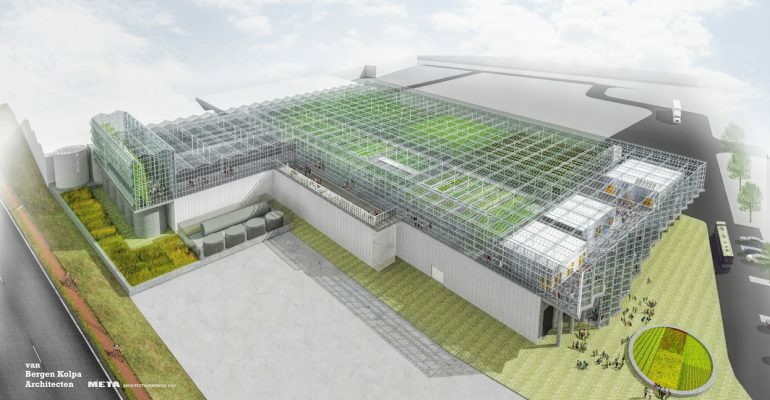 Rooftop greenhouse initiative: Agrotopia (Dutch).